Legendary .50 BMG maker Barrett showed off a new rifle at SHOT Show 2019, the REC10. This modernized AR-10, chambered in .308 Winchester, is a continuation of the line that began with the REC7, which is currently offered in 5.56 NATO, 6.8 Remington SPC, and .300 Blackout. The REC10 features a Magpul MOE SL buttstock, an ALG Defense QMS trigger, a T8-41 DLC-treated bolt carrier, precision machined 7076 aluminum billet upper and lower, finished in black or desert tan, a matching M-LOK handguard, full-length rail, Magppul MBUS sights, a button-rifled, chrome bore, CMV 16-inch barrel with 1:10 twist, and Barret flash hider. It weighs 8.0 pounds, and has an overall length of 37.5 inches. It comes with a 20-round Magpul magazine and Barrett-branded soft case. The handsome REC10, new from Barrett. All controls on the REC10 are ambi. It sports a Raptor charging handle, ambi safety with 45-degree throw, and ambi bolt catch and magazine release. Barrett reps say the REC10 barrel is made on the same machine as their .50 BMG precision rifle. It’s handsome as well as a dream for any family, range, or department that shares a rifle between right-and left-handed operators. MSRP on the REC10 is $2,995. The REC10 enjoyed most of the limelight at the Barrett booth. But their Fieldcraft hunting rifle, available in numerous calibers as a bolt action repeater, also enjoyed a deserved prominent spot in the display, as a celebrated standout in the hunting rifle market. Available in 10 different caliber/barrel length combinations, the Fieldmaster has a lightweight, grey, carbon fiber stock, TImney trigger, and match grade barrel. MSRP starts at $1,879 for this rifle. While there was nothing new about the Fieldmaster at the show, a Barrett rep did tease OutdoorHub writers with speculation that more chamberings, including 5.56 NATO, may be coming in 2019. Barrett fans will want to keep an eye on this one. 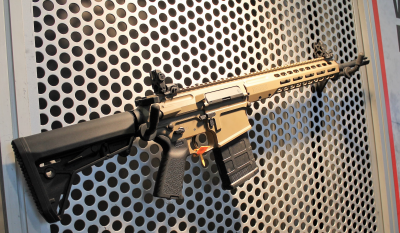 The Fieldcraft rifle at the Barrett booth. The post SHOT Show 2019: Barrett releases new REC10 Carbine; teases Fieldcraft update appeared first on OutdoorHub.